Do you have strong vocabulary skills? Are you confident that what you are narrating with your higher officials is easy to understand? I’m sure you’ll agree with me if I say using strong words may increase your confidence and give the best impression in front of everyone. 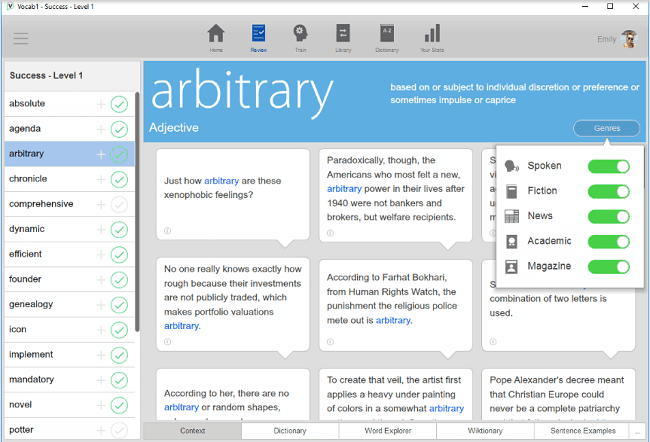 Would you like to make use of a tool to improve your vocabulary skills? I recently discovered a tool called vocab1 which is the best in class educational software to double your vocabulary word power. It is a scientifically designed software which helps to improve your communication, writing, and conversations. 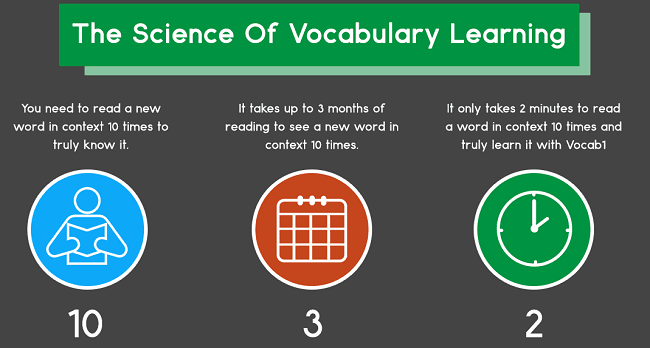 Vocab1 is the only vocabulary learning tool in this world to use a corpus to accelerate your learning. Vocab1 is using the corpus to prove themselves as the best in the class of vocabulary software (A corpus is the collection of a massive database of words which are used by professional authors and other geeks). Not only it has a corpus, but also an advanced research and database processing to extract the contextual usage examples from the database. Vocab1 team has done some great work in collecting all kind of power words to make your speech attractive. It is an extraordinary tool which has an extensive collection of power words. It was the first vocabulary building software to use a corpus of contemporary American English (COCA) by the Brigham Young University. Its corpus is having more than 520 million words of text and it is equally divided into fiction, popular magazines, newspapers and academic books. Because of such huge collection of words from various sources, it can help you learn words faster than ever before. Based on research, it shows that human brain is “hard-wired” to learn words by reading them in context. Each and every time people prefer more words from any software, because “more is better.” So in that case vocab1 is unbeaten by any other software because most of the software are not even having half of the database of vocab1. How Easy Is It to Use Vocab1? It works much like a simple software. You can install vocab1 pretty quickly on your device. Or you can log-in its cloud-based account to access it. Its interface is very easy to use. It has the sidebar facilities for navigation to jump to any section you want to explore. If you are tired during the middle of playing a game (lesson) or realize that you’re not quite ready to take action on it then, you can jump to next one and later on you can access the unfinished game. In any place, Language plays a vital role in everyday living. Other than that it is more useful in professional life to take a step forward and to grow more. Vocab1 is for them who want to build strong grip on vocabulary. And it’s for people who strive to talk a lot with others in English, so it’s a helpful tool for each and everyone including the English geeks because it is the software which suits for all. Communication skills will be improved so that you can impress people quickly and make each and every word count. You can get instant respect and credibility so that people will pay attention to your speeches and make you as lead. You can be an amazing writer by knowing the whole words; you can sprinkle all those power words in your blog articles, book, or novels. Helps in boosting your career by being smart and learning everything with ease. Ability to increase your command in the English language and it brings respect from your co-workers. It will be helpful for a central authoritative list of exams like Ace the GRE, SAT, GMAT and IQ tests. As I had explained about the corpus in above points, it has contextual learning which includes words from all sorts of resources. It also provides audio pronunciation of the phrase they are more than 20,000 pronounced words. Vocab1 is having a broad range of online resources which can increase your learning potential by connecting with thousands of online resources. Along with these, it’s also having the vocab1 word messenger and a massive database. 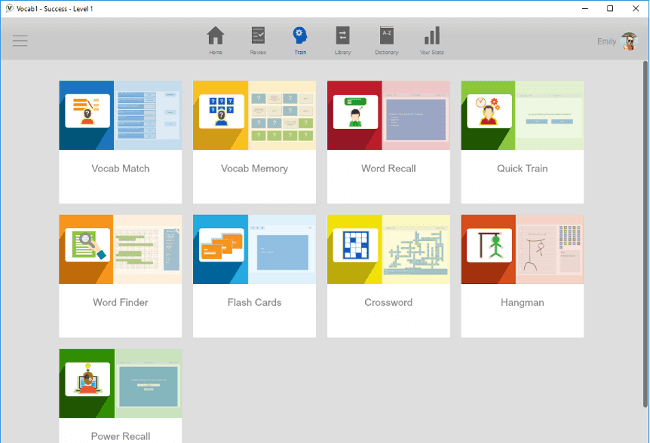 If you are bored with the old learning process, then to make you learn faster vocab1 has added some games and activities. They have included games and activities because human brain adapts faster for games and other activities which are visually appealing to eyes. It is having games like crosswords and hangman etc., and other activities are a memory, word recall, fast train, word finder, flash cards and power calls. In addition to these games, you can track your progress and see yourself the improvement. It is the effective way to motivate yourself because people always tends to learn from the process. You can see this tracking feature in your stats in word recall. 1. Spreeder CX Review: Does It Really Help You Read Fast? EReflect, the company that made vocab1 offers a great technical support. You can contact the customer support by phone or email to ask for help. They are always ready to help in any technical suggestions. Along with this vocab1 also offers the fearless 12-month refund and $50 guarantee. If in case you are not satisfied with it. Then you can make use of that. So this is how vocab1 is going to be helpful for you. For any assistance or queries do let me know. I would love to hear from you.